Nice assortment of acclaimed fonts (49) from the PP2 foundry. 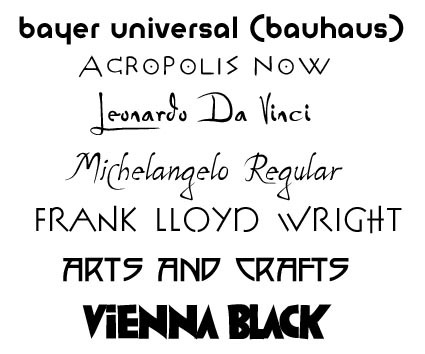 Most of them are art-inspired, including the coveted “Bayer Universal”, the one and only “true” Bauhaus font. The trendy “Da Vinci” font is included, in forward and authentic "reverse" version. 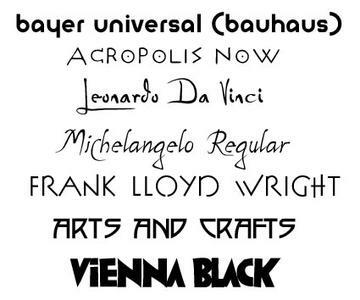 Some very nice dingbat fonts are also included, in Da Vinci, Miro, Pressig, and Frank Lloyd Wright styles. Great for designers, architects and artists.